Follow 13th Street South to the 4th red light and turn RIGHT onto University Blvd. (8th Ave. South). Make sure you are in the left hand lane. After approximately 4-5 blocks, you will pass under a brick pedestrian walkway. Get in the left hand turn lane immediately after the walkway. Take a LEFT into the parking deck. Take a RIGHT out of the parking deck onto 7th Avenue South. Take an immediate RIGHT onto 18th Street South. Go 3 blocks and take a RIGHT onto 11th Avenue South. 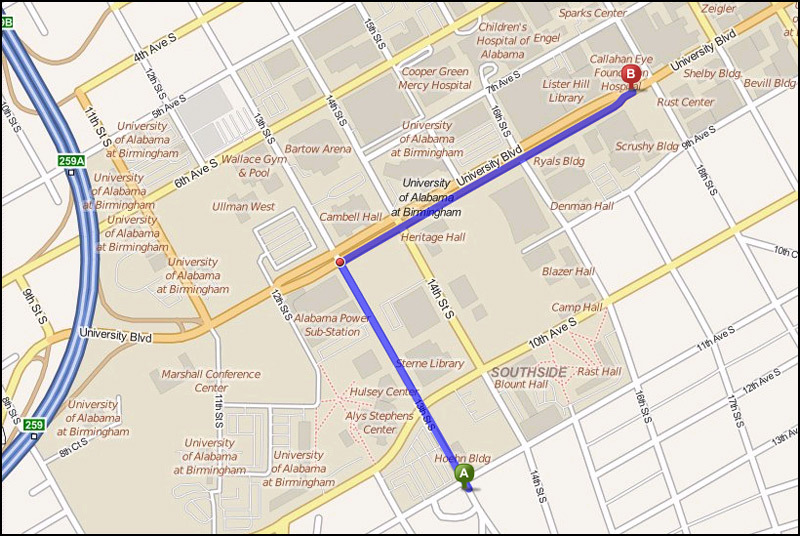 Follow 11th Avenue South to the UAB Highlands Hospital located on the corner of 11th Avenue South and 13th Street South.